Widowed, world-famous neurosurgeon Michael Hfuhruhurr is trapped in a loveless marriage with Dolores Benedict, who is only interested in Hfuhruhurr's money. On a trip to Vienna to attend a medical conference, Hfuhruhurr falls in love with a bottled brain, and finds himself in the middle of murders committed by the elevator killer. 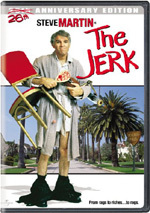 Depressing thought of the day: I’m old enough remember when audiences knew Steve Martin as a comedian instead of as an actor. I think it was right around the time of 1983's The Man With Two Brains that the dominant opinion started to change, mainly because I think Martin had ceased to perform stand-up by that point. The more movies he made, the quicker memories of the old "wild and crazy guy" faded. This change didn't happen because Brains lit up box offices, as I think it fizzled theatrically. I won't try to convince you that Brains delivers a forgotten gem, because it doesn’t. However, it does offer a moderate amount of fun and it remains one of Martin's better early efforts. World-famous brain scientist Michael Hfuhruhurr (Martin) still mourns his late wife Rebecca but he moves on when he runs into – literally – recently widowed babe Dolores Benedict (Kathleen Turner). Dr. Hfuhruhurr hits Dolores with his car and causes a brain injury that he then corrects. Dr. Hfuhruhurr falls for Dolores, and the conniving gold-digger sees Michael as another easy mark. She seduces him and the pair marry, but she claims continual headaches to escape the need to consummate the relationship. When Dr. Hfuhruhurr gets the chance to attend a conference in Austria, he accepts as he thinks the trip will loosen up Dolores. It doesn’t, but Michael develops a new relationship when he meets Anne Uumellmahaye – or part of her, at least. Anne exists as a disembodied brain who communicates with Michael through telepathy. This leads to a curious love triangle. Ironically, the worst thing about Brains stems from the fact that it starts out extremely well. The first 15 minutes or so are frankly hilarious, as the movie provides one great gag after another. And then it hits a wall. Don't ask me to pinpoint exactly when this happens, because I can't, but it definitely occurs. The rest of the film remains entertaining, and a few good jokes pop up from time to time, but the overall product seems a little flat. Still, “flat with a few strong spots” beats most comedies, as the vast majority of "humorous" movies are lucky to eke out a single laugh, much less a bunch of them. When it succeeds, Brains does so largely due to the presence of Martin, who was still getting his feet wet in films as of 1983. He'd made more than a few by that point but his persona still seemed bound to the stand-up comic of the 1970s, despite an attempt in 1981's dramatic musical Pennies from Heaven to alter that. The change would occur - aided by the success of 1984’s All of Me - but Martin still hadn't made that leap in 1983. Despite the hit or miss nature of the gags in Brains, Martin stays consistently watchable and entertaining, and he's backed by an able supporting cast. Kathleen Turner proves surprisingly adept at comedy in her role as evil wife Dolores. She's able to go from sinister to sweet and back again with ease and she provides a fun presence. Also good is David Warner as Dr. Necessiter, an Austrian scientist, and the cast even features personal favorite James Cromwell in a goofy turn as a realtor. By the way, the film includes two other noted participants, but I won't reveal their identities; to do so would spoil some of the fun. And Brains does give us a reasonable amount of enjoyment. 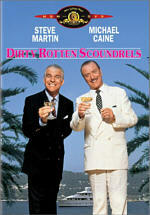 It sputters at times but still comes with enough charm and wit to make it likable. The Man With Two Brains appears in an aspect ratio of approximately 1.85:1 on this single-sided, single-layered DVD; the image has been enhanced for 16X9 monitors. The transfer came with a mix of problems. Sharpness was adequate for SD-DVD. Close-ups showed reasonable delineation, but other shots seemed less consistent and a fair amount of softness resulted. I noticed no issues with shimmering or jagged edges, but light edge haloes appeared. Print flaws became a persistent distraction, as the movie suffered from a mix of specks and debris. Those issues never seemed heavy, but they gave the image a messy look at times. A few blue blotches appeared during the tour of Dr. Necessiter’s condo as well. Colors seemed adequate. The movie’s natural palette showed passable hues without serious problems, but they tended to be a bit flat and drab. Blacks were decent, and shadows showed reasonable clarity. This was a watchable image but no better. As for the movie’s monaural soundtrack, the quality of the track was also acceptable but flawed. Dialogue always remained intelligible and usually appeared moderately natural, but more than a little edginess came along for the ride. Effects were thin but moderately clear and realistic, and the movie's goofy synthesizer score came across as similarly adequate. Both aspects of the mix lacked any significant dynamic range but they sounded decent, with only a little distortion at times. This wasn’t an impressive track but it appeared decent for its age. How did the 2014 DVD compare to the original release from 1999? Audio seemed similar, if not identical. The biggest change came from the visuals, mainly because the 1999 DVD went with a 1.33:1 aspect ratio while the 2014 release delivered the film’s theatrical 1.85:1 framing. That part made me happy, but the quality of the image wasn’t a notable upgrade over the 1999 DVD. The aspect ratio made the 2014 release more appealing but the picture itself didn’t look especially good. In terms of extras, the 2014 DVD equals the original disc from 1999. That one included no supplements, and the widescreen DVD follows suit. 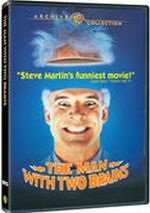 While not Steve Martin’s best work, The Man With Two Brains proves to be reasonably entertaining. It offers a silly piece with enough laughs to keep the viewer interested. The DVD comes with erratic picture and audio as well as no bonus materials. It’s nice to see the film in its original aspect ratio, but the quality of the release disappoints.